More puppets! It’s an obsession! Bargain basement animal puppets at $3 each from The Reject Shop, Penrith Plaza. Not sure why the Dalmatian has a yellow nose. I originally rejected these four puppets as my least favourites, but at just $3 each they made a hard bargain to pass up. 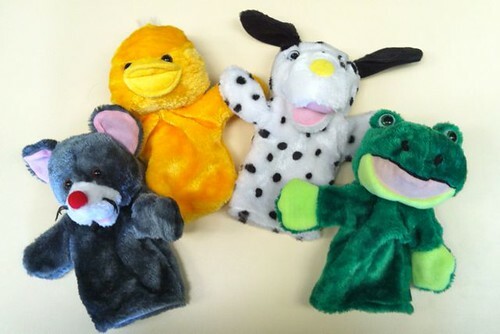 More cute animal puppets, this time from the online Sunshine Markets, Queensland. The parcel arrived today! 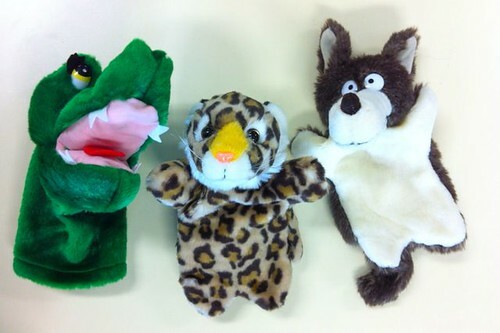 These were an irresistible Internet find: crocodile, leopard and (what the online catalogue called) “the Big Good Wolf”. Really? With those eyes?